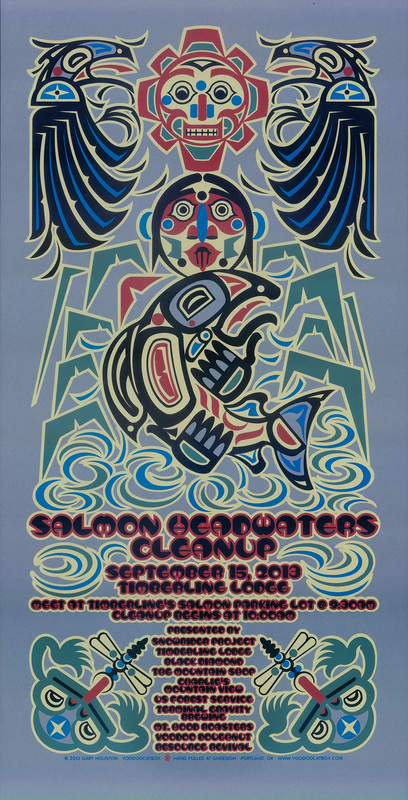 Please join us Sunday, September 15 at Timberline Lodge’s Salmon River parking lot for the 3rd annual Salmon Headwaters Cleanup. Sign-in begins at 9:30am and cleanup of The Salmon River Headwaters begins promptly at 10:00am. All participants except the Portland Mountain Rescue crew will head down canyon. Pack gloves, water, snacks, warm layers and sunscreen. Be prepared for alpine weather contingencies. We will provide coffee, doughnuts, garbage bags and an after party, sponsored by Terminal Gravity Brewing, at Charlie’s Mountain View in Govy afterwards. Thank you in advance to our partners Portland Mountain Rescue, The US Forest Service, Timberline Lodge, Black Diamond, Voodoo Doughnut, Resource Revival, Mt. Hood Roasters, The Sandy River Watershed Council, Charlie’s Mountain View and participants. H owdy, I’m too gimped up for the cleanup, but was wondering if I could score a poster somewhere. You can pick up a limited edition poster at the Mountain Shop in Portland or we can mail you one. We just sent you an email for details. Thank you!